When Bailey arrives, she just wants to get through summer quietly, spending as much time in the water as she can. Then she meets Adam. Bailey’s not looking to make friends, but Adam isn’t easy to ignore. Neither is his ex-girlfriend, Clare. As Bailey grows closer to Adam, she draws Clare’s animosity. Will Bailey be able to keep her past a secret, or will Clare discover and reveal the sinister truth about how Bailey really got her scars? Bailey makes friends: Adam who is there with his little brother Jack, and who has a lot in common with Bailey; Freya her cabin-mate; Amber and Jenny who have the cabin next door; and Clare, the most complicated, destructive and wounded of her new acquaintances. All these people come to the resort every year, and it leaves Bailey playing catch-up, and vulnerable to mis-information. Underwater is a ‘teenagers dealing with issues’ novel, Bailey sorting out what sort of relationship she wants with Adam, and shyness, sexual orientation, self-harm and gender difference all get an airing: “I guess they don’t realise the things that impress girls aren’t the same as the silly things other boys are impressed by.” But beneath all of this is the slow burning dread of finding out what happened that night in Wellington, the consequences of extreme violence, the inability to talk about traumatic experiences – not even to counsellors, the guilt, the regret, and the nightmares. And the realisation that your focus might be wrong, that a vital clue to what happened that night might be right there in front of you. As well as being party to Bailey’s thoughts, there are clues to her state of mind: Seeing red board shorts at the pool as blood in the water, telling Tilly unbowdlerised versions of fairy tales, considering self-harm as a distraction … “… memories are like being underwater. You can see the real world, but it’s so remote you don’t feel connected to it” – like remembering how her mother used to wake her up in the night each year at her birth time – and turning seventeen and recognising for the first time “I had missed the moment I was born.” Taking on the mother role for Tilly adds another veneer of sadness for Bailey. I found myself wondering a bit about the existence of Gran and Tilly when they were apart from Bailey, Tilly and Jack spending a lot of time on the jungle gym, and I was hoping Gran wasn’t alone swigging G&Ts in her cabin. 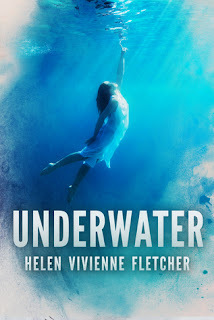 But apart from that, Underwater is an absorbing read, there is a truly upsetting climactic scene, and the horror of what Bailey and little Tilly have lived though is skilfully revealed. Another YA novel that will appeal to a wider group of readers.